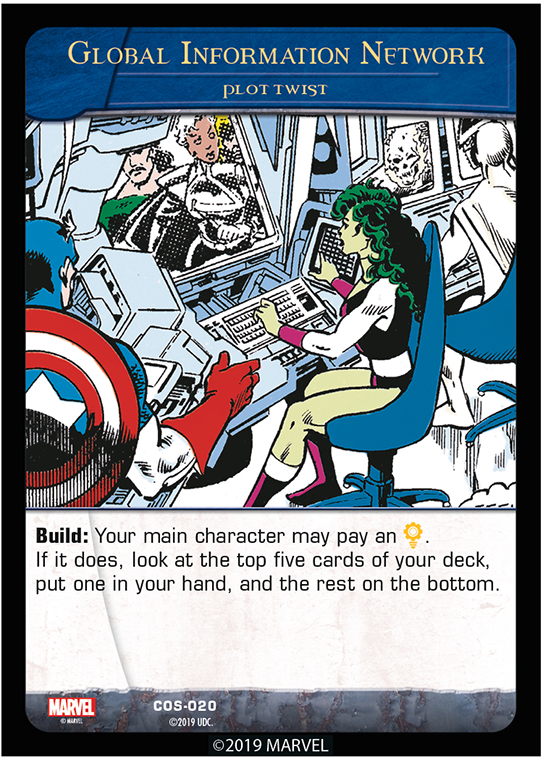 Welcome back to another preview article for Cosmic Avengers , the first Issue in the Infinity War Story Arc for VS. System 2PCG! First up, we have two characters who spend significant time searching their souls as they give up their mantles! Note that these two guys are AKA Captain America and Thor, respectively, because they are still Steve Rogers and…well, Thor. 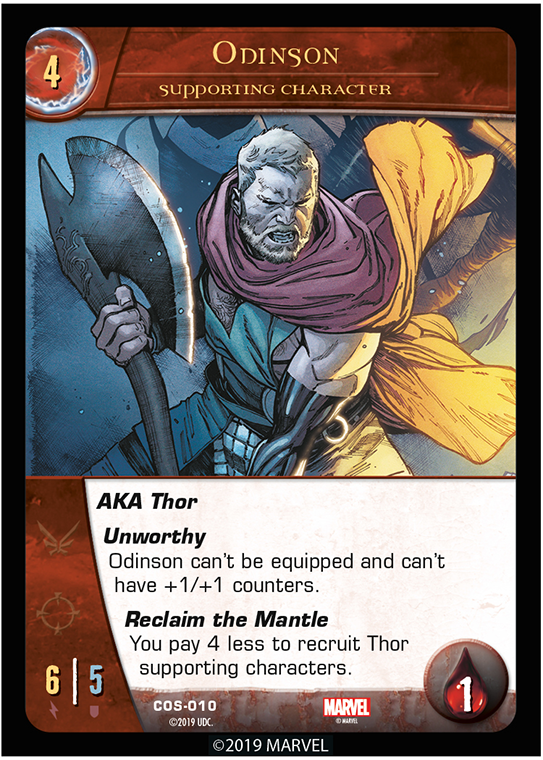 You can use their Reclaim the Mantle powers to reduce the cost for any Caps or Thors, including ones who are only AKA those names. (I’m looking at you, Supreme Leader.) 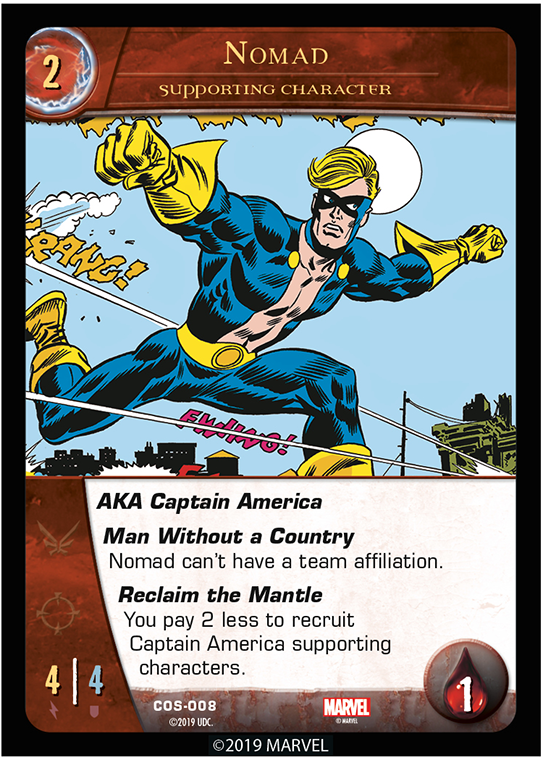 But you can’t reduce the cost of characters who just share the mantle, like *Captain America*…or *Thor*. Anyway, a couple of notes — When Thor is ready to start being “the” Thor again, Jane gracefully demurs. 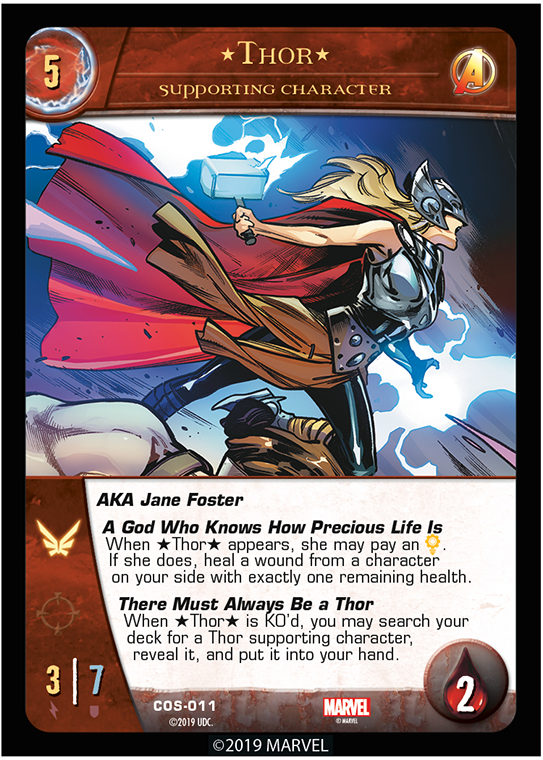 To represent this, her There Must Always Be a Thor power can only search for a card named “Thor” (with no *s) or with AKA Thor (like Odinson). It can’t get a copy of herself. Also, like Wakanda from the last preview, Jane’s A God Who Knows How Precious Life Is is not a super power. And yes, there is a series of characters with powered-up keywords like hers in the Arc as well! 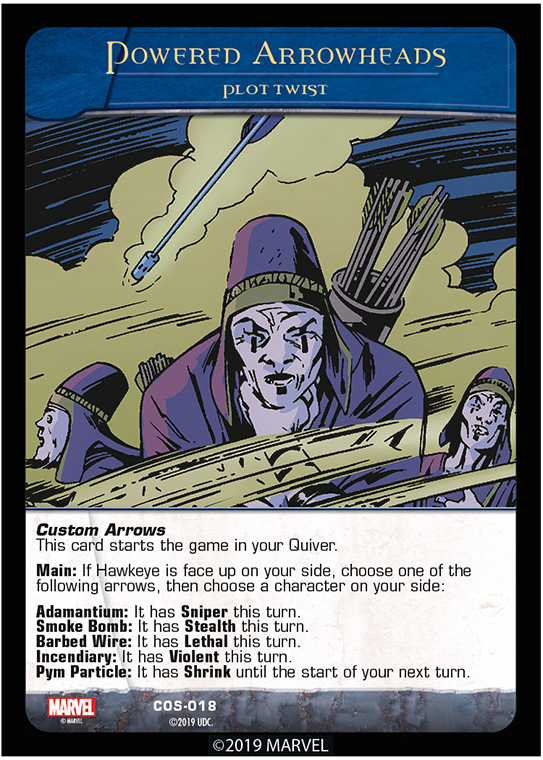 Speaking of Wakanda, there is another series of cards we are introducing, but this time they’re Plot Twists. Here’s one now! I feel we would be remiss if we didn’t show you a new main character before we go! This one hits the target! Pretty accurate and to the point! He certainly is nock the most complicated main character we’ve ever made! This card really puts a nice bow on the article! But what, oh what is the Quiver? Well, the Quiver is a pile of four cards that start the game set to the side. 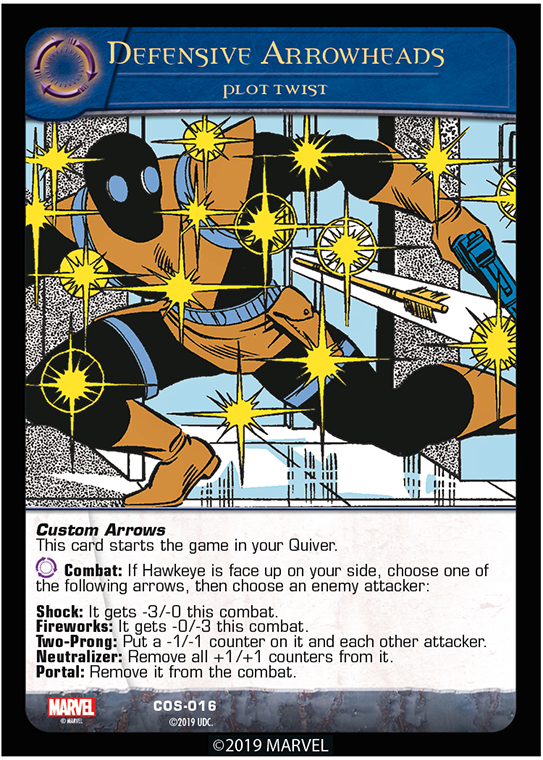 And once Hawkeye levels up, he has access to them. As you might guess, they represent arrows! 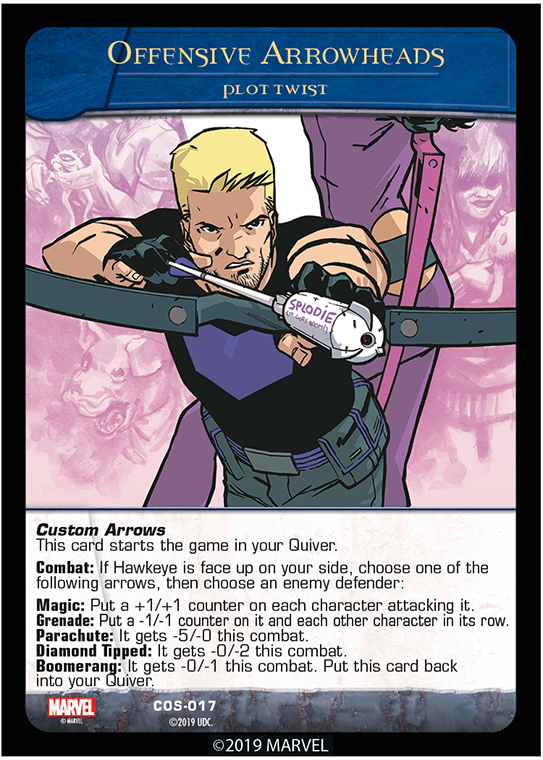 But Hawkeye has so many custom arrows, we didn’t want to just have 4 – so we didn’t! 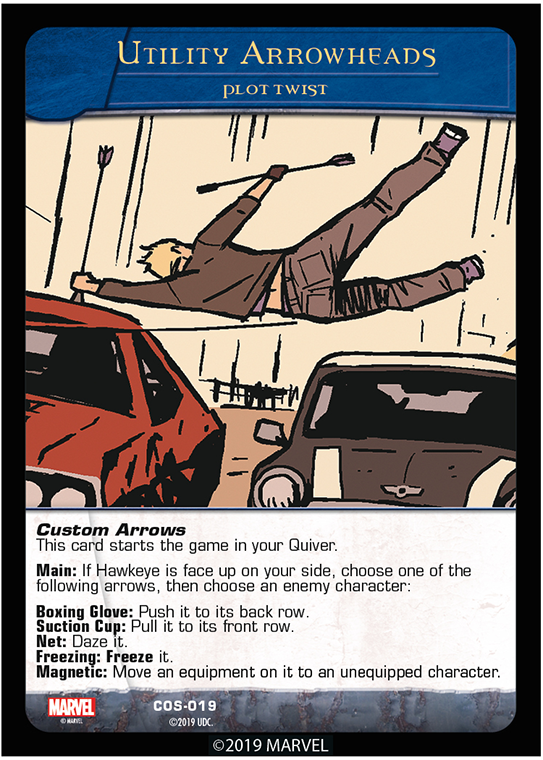 Once a Custom Arrows card is in your hand, it acts just like a regular Plot Twist. 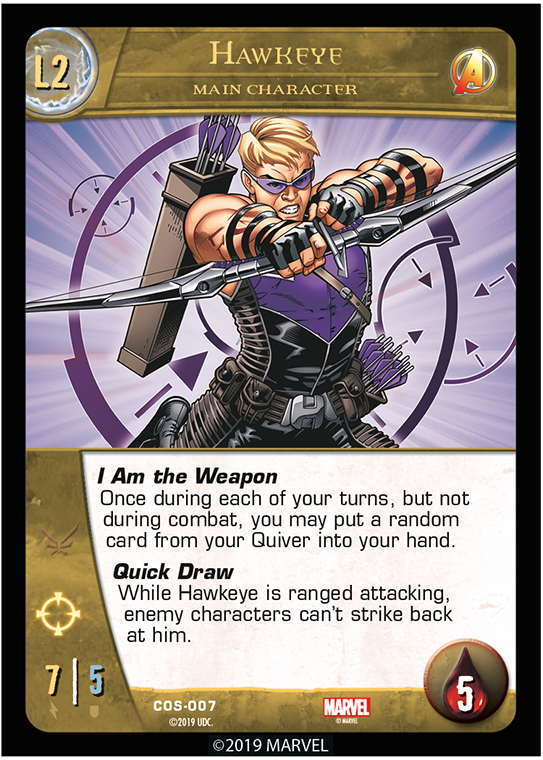 Note that to be able to play any of them, Hawkeye must be face-up on your side, but for the Combat Plot Twists he doesn’t have to be in the combat himself (he can shoot really far). 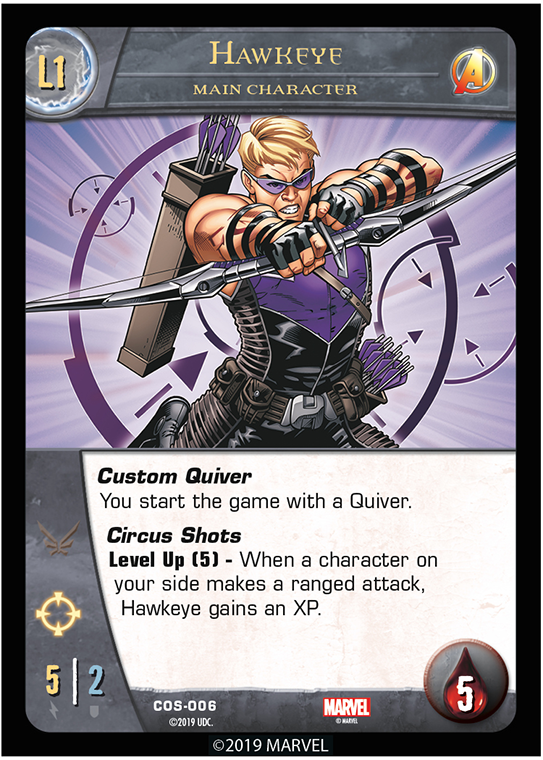 Also, please note that if you choose Magnetic on the Utility Arrowheads card, you can move the enemy equipment to an unequipped character on your side. Well, that’s a real feather in our caps? We’ll talk to you soon for our last preview, which I promise will be marvelous!